No one knows what angels look like. There are a wealth of popular images, in movies ,books, and on television. There are songs, plays and paintings, but no one really knows. Why? Because angels usually come in the dark. Why? Because that’s where the people who need them the most usually are. In the dark. 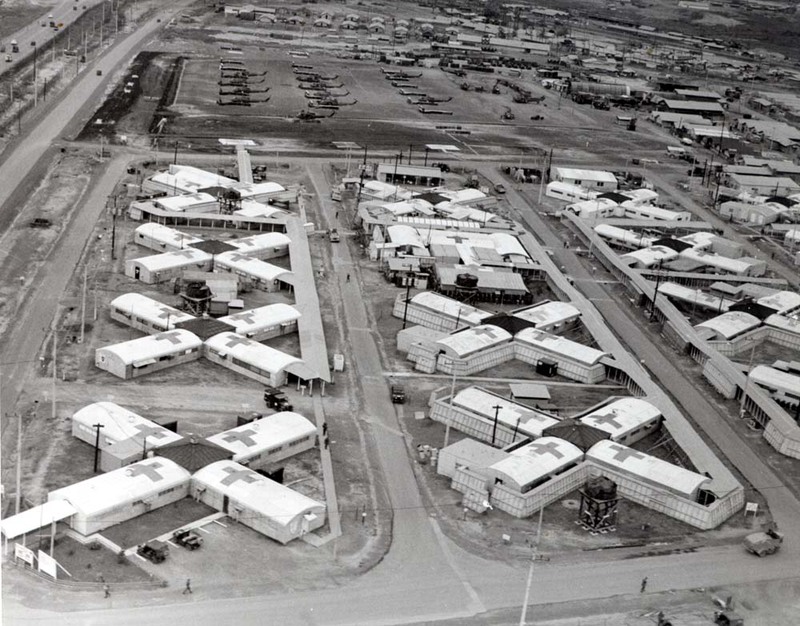 The building I was in was made of four pre-fab units arranged like the spokes of a wheel, with a medic station at the center. I was about half way down one spoke, closer to the door than the medic station, in a standard Army bunk. On the third or fourth night after my arrival I awakened around two or three in the morning. I don’t know what woke me, but I couldn’t get back to sleep, so I swung my feet off the bed and sat up for the first time since I had been there. I was wide awake and hurting. Behind me someone was moaning in his sleep. I thought It’s probably the 11th ACR guy with the broken foot, it hurt him whenever he turned over. From somewhere in one of the other spokes a man was crying, very soft and quite, you could scarcely hear it. I wondered if he was crying from pain and what kind of pain it was; in his body or in his soul. Getting to and thru the door pretty well used me up, so I sat down on the crates and took things in. It was a moonless night; to my left I could see the berm line that ringed the compound. Every thirty yards or so a bunker was set into the berm, a guard tower each hundred yards. There was concertina wire and apron fences, barbed wire strung in every possible configuration. Out beyond the wire ,in another compound or another part of this one an occasional tracer would arc in or out; green ones coming in and red ones going out. A half mile or so beyond the berm a Firefly ship was orbiting, dropping flares randomly around the perimeter. It seemed as though the whole world had been turned into no-mans land. I was nineteen, hurting, unable to move very well, sitting in the dark, in no-mans land, ten thousand miles from home, and Christmas was ten days away. I was at the bottom of the deepest, darkest pit I had known up to that time. Then I heard a tapping and the light, warm ,breeze brought the faint smell of flowers. Flowers don’t grow in no-mans land ,I thought. The hospital wings were all blacked out so as not to provide a target, there was no moon, and the darkness was near total. The sound was coming from my right, but peering into the dark I could not see a thing. Just the tapping ,as though some one was tapping a piece of wood with a stick. It was rhythmic , regular, and getting closer. The different parts of the compound were connected by board walks to allow the medics and doctors to move place to place without walking in the mud. I had seen the nurses travel the walk with a stick; a pointer or yardstick dragging along the edge of the walkway to orient themselves. Peering into the night, moving my head side to side as the Army taught you to engage your Peripheral vision, I could just make out the shape of a nurse. She passed within two or three feet of me and opened the door. The faint light from inside must have revealed me to her out of the corner of her eye. She turned and looked at me for a moment, she appeared as a dark shape silhouetted against the dim light from inside. Propping the door open with her stick, she walked over to me , put her hand on my bare shoulder and bent down untill her face was mere inches from mine, as though she was looking into my eyes. The scent of the flowers rose from her like a warm damp cloth and bathed my face. I could see nothing but her dark silhouette. She seemed to peer into my face then leaned forward till her forehead touched mine, for a moment, then squeezing my shoulder once, she stood ,stepped to the door, retrieved her stick, and went inside. I sat there on the rocket boxes and looked at the same landscape. I noticed that the light from the occasional flare, floating down on its small parachute, would glitter along the wire and turn it to fine spun gossamer. Looking up at the sky, the Pleiades had risen, and Saturn was up. I thought my brother would know the names of the rest of the stars. I wondered if my wife was going to work yet, and thought of her being at my folks house for Christmas and my big, inclusive family; the more the merrier; and them taking her as their own without reserve, and I smiled and I was happy. Minutes before I was at the bottom of a deep dark hole, and now everything was fine, I was content, comforted. A featureless,fragrant shape, had come out of the dark, touched me and passed something to me, then left me there. Never a word had been spoken. Nothing had changed, but I was fine, I was fine. After a minute or two I began to feel tired so I made my way back inside. I looked around for the nurse; I wanted to see her face, learn her name; but no one was there. So I drug myself back to my bunk, put the crutches back, laid down ,and went straight to sleep. When I awoke in the morning I felt more rested and refreshed than I had in a long time. As the day crew made their rounds I asked each one about the nurse; who was she ,where was her regular station. No one had a clue. Before it could turn into a full-blown mystery, I was told that they were shipping me to Japan that afternoon. They were clearing out all of the hospitals in country to make room for the expected Tet offensive. Before I could solve my little puzzle ,I was gone. I never learned her name,I could not honestly tell you her age or race; but I know what she smelled like. Ten years later, my wife and I had bought our second house and were looking to improve the landscaping. We were going thru a local nursery, looking at trees, flowers and grasses. She was in the flower section trying to choose between daisys and violets, and I was wandering thru the flowering shrubs trying my best to be enthused about the project. I was halfway down the aisle when that warm damp cloth smacked me in the face. In a flash I was back in the dark of that night, sitting on those crates, gazing at the wire. I turned around , half expecting to see an Army nurse standing there. There was no one, only the shrubs. I started smelling the blossoms, trying to localize the fragrance, and after a dozen plants or so I had it. Picking up the plant I carried it outside ,away from the others to make sure. Out of the greenhouse I stopped and buried my face in the big white blossom and breathed it fragrance deep into my lungs . It was her. I looked for a tag on the plant, there wasn’t one. Back inside I sat the pot on the sales counter and asked the clerk what this plant was. She didn’t know. A little old lady with a funny hat and gardening gloves was behind me and overheard us. She tapped me on the shoulder and said a name. I turned, bent down; she wasn’t much over four feet tall; and asked her to repeat that. She smiled and said ” Gardenias”. I repeated the name “Gardenias”. the clerk smiled and said “Gardenias”. My wife came up and looked at the plant then looked at me with a questioning look and I said “Gardenias”. She said ” I know,I love Gardenias”.My wife went up about three notches in my estimation. We bought the plant; it was the only one they had; planted it by the drive where it would get plenty of sun. It bloomed once and died. Over the years I have planted a half-dozen “Gardenias”. They bloom once and die. I think they die of despair, but that is another tale. What I learned that night so many years ago was this: There are bad things in the dark. They can pull you down to depths from which you cannot escape. But, there are angels out there in the dark also, And they can lift you up out of the blackest pit , and with the lightest touch restore your hope. And they smell like Gardenias. Posted on December 20, 2010, in Where This Road Goes and tagged 93rd EVAC, angels, Army, Christmas, courage, Crutch, dark, Flower, Gardenias, No man's land, nurse, pain, Pleiades, Restore, Viet Nam, War. Bookmark the permalink. 2 Comments. Thank you so much for sharing this story. It really touched my heart. I have worked, over the years, with many nurses like the one you have described. I hope that those patients that I have cared for would count me among them. So often it is the smallest gestures that restore hope in our darkest, loneliest hours. I am glad that she was there. God surely sent you one of His angels that night.